Clean Mill Valley’s Gold Star Merchants! Clean Mill Valley would like to single out the following local businesses for special recognition. Everything is coming up rose petals! Residents and visitors alike can’t miss the inviting sidewalk in front of the EO Exchange Store at 84 Throckmorton at Lytton Square where the staff at EO sweep the sidewalk daily and scatter a generous portion of rose petals in front of their store. An early member of Clean Mill Valley, they didn’t need to be asked to join our group to make our town cleaner and more inviting as they were already doing that on their own. Many thanks to Sabrina Bedell, EO’s Exchange Store Manager, and Jessie Fishburn, Retail Sales Associate for their care and dedication. Peet's Coffee & Tea in Lytton Square deserves a gold star for their creative approach to eliminating coffee refuse and their diligence in keeping the heart of our town clean. Store Manager Matt Borello worked with CMV’s Jill Young and the City of Mill Valley Public Works Superintendent Denise Andrews to remove the city-owned garbage can which was emptied each morning and substituted it with an attractive Peet’s-owned garbage can that their staff empties multiple times each day. This has reduced the paper products that often flowed onto our sidewalks and into our gutters. Thank you Matthew and your regional staff for making this happen. KUDOS! Playa Restaurant recently received acknowledgement from CMV for their good care of the sidewalk in front of their restaurant. It’s a pleasure to have them as a new eatery in town. Joe’s Taco Lounge has also received acknowledgement from CMV for their longtime commitment to keeping their restaurant frontage litter-free. With a public bus stop close by they are cleaning more than their share. Thanks to these merchants for caring about Mill Valley! What is the Mill Valley Merchant Program? 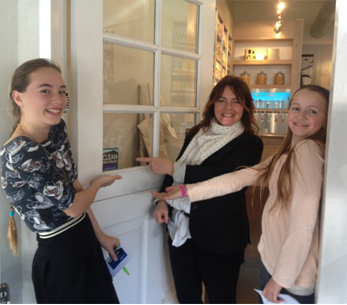 Clean Mill Valley has teamed up with Greenwood School to create a program for local merchants. 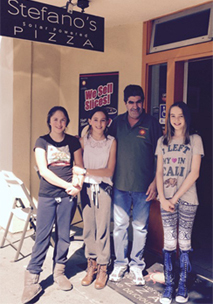 Beginning in February of 2015, Greenwood School students started recruiting local merchants to participate in a program to keep Mill Valley litter-free. When you see the Clean Mill Valley Merchant Participation decal, you’ll know that business is committed to keeping our town litter-free by picking up any litter from in front of their business and sweeping on a daily basis, as well as educating their employees about the importance of keeping litter properly disposed of. A designated representative of the business will sign the Clean Mill Valley Merchant Pledge and students will periodically visit afterwards to ensure that pledges are being kept. Businesses who have signed the pledge will be mentioned on this website and during the ongoing publicity campaign for this program. We hope that by encouraging our citizenry to patronize these businesses and give their support, we can motivate the merchant community as a whole to participate. Together, we can make a difference. Our children will thank you! For additional information about the program, contact Joan Murray at 388-3614 or joan@cleanmv.org. 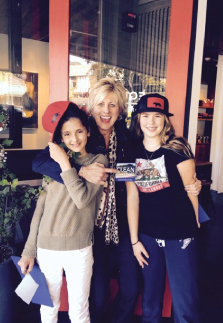 Greenwood School students along with their Environmental Studies Teacher, Julie Hanft, have collaborated with Clean Mill Valley members on other projects to improve our town and its natural environment. 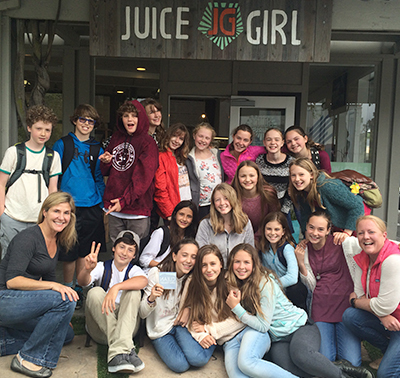 Greenwood 6th Grade students shown with staff at Juice Girl. 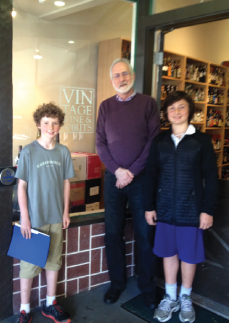 Clockwise from Top Left: Greenwood 6th Grade students shown with Helen Russell at Equator Tea & Coffee; Richard Leland at Vintage Wine & Spirits; Paolo at Stefano’s Pizza; and EO Exchange. Clean Mill Valley is proud to acknowledge the following local merchants who have made a committment to help keep our town a beautiful and healthy place to live. Please patronize these businesses and let them know you appreciate their efforts!